US, 1989, 95 minutes, Colour. Patty Duke, Jane Wyatt, Norman Lloyd. 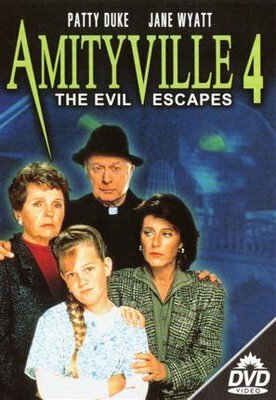 Amityville IV: the Evil Escapes is a telemovie version of Amityville horrors. The consequence is that it is less gruesome than its predecessors and is geared for a wide audience to be scared while watching Sunday Night at the Movies. The film opens with the house at Amityville, the usual horrors, priests trying to exorcise the house and one being victimized. The evil takes refuge in an ugly looking lamp and lamp stand. It then takes possession of a young girl in California and wreaks its usual havoc in a Californian house. There are the usual surprises, shocks, deaths. The evil is confronted and ousted by the young priest but, of course, finishes up in a cat whose eyes gleam as the film ends. Patty Duke is competent as the mother and is used to this kind of telemovie. Veteran Jane Wyatt has a meaty role as the grandmother who confronts both family and the evil (50 years or more after she starred with Ronald Colman in Lost Horizon). It is the usual kind of material ? though one wonders why another version of Amityville was filmed in the late '80s. There had been so many variations on the theme. 1. Enjoyable horror? The tradition of the Amityville films? The transfer to California? The audience for this kind of film? 2. The telemovie style, the horror adapted for the home audience? The treatment of the horror and characters? The family, the difficulties, the exorcism? The end? 3. The title and the indication of themes? 4. The parish priest, the exorcism of the house, the malevolent lamp stand, the presence of evil? Father Dennis and the exorcism? His injuries, hospital? Taking the stand? The news of the auction, following the presence of the evil, in the lamp stand, his going to California, unable to connect by telephone, his arrival, participation in the confrontation with evil, the exorcism? 5. Nancy, ordinary young woman, adjusting with her children, the clashes with her mother, having to go to live with her? The difficulties in the routine, at home, school? Her having to apologise? The clashes with her mother? Jessica and her fantasies of her dead father? The growing evil, confrontations, Father Dennis and his arrival, fighting the evil and its destruction? The sketch of her children: Brian, his support, Amanda and her growing up? Jessica and her youthfulness, being possessed by the evil one, seeing her father? The clashes with Grandma? 6. Grandmother and her strength of character, the gift from Aunt Helen (and Aunt Helen and the hospitalisation, her friend, the power of evil)? The clashes in the house, Peggy the maid, trying to get used to the children, the mess, blaming the children, arguing with her daughter? Her strength of character, the presence of the evil, her defying it? Father Dennis? The relief of the house - and her reconciliation with the family? The sketch of the maid, her confrontation with evil? 7. Special effects, suspense, suggestions, animals, the evil lamp stand, the face of the devil - the torments, the killing of the workmen, etc? The lamp on the seashore - and the continued presence of evil? 8. The continued popularity of this kind of film?